The most popular tourist destination on Hilton Head Island, SC, without a doubt, is Forest Beach and the luxurious new Seacrest Villas, pictured above, is at the heart of it, right off Coligny Circle and with the shops at Coligny Plaza in the background. Forest Beach real estate is a community that has something special for every member of the family. 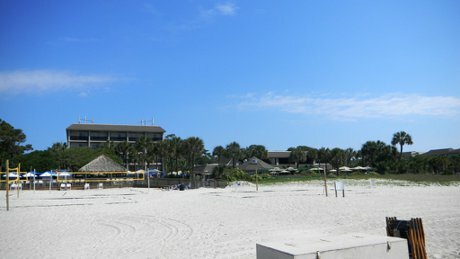 North Forest Beach has two of the newest condominium complexes on HHI in The Sea Crest and North Shore Place Villas, which would be just out of the picture below to the right, across NFB Drive from the ocean, and is otherwise populated by residential homes. As you are searching properties, use legal addresses 'HHBS1, HHBS2, HHBS3' for the oceanfront and ocean-row homes on the beach side of North FB Drive. Ocean-oriented homes at slightly reduced prices can be found on the other (land) side of North FB Drive in legal addresses 'HHBS 1A' and 'HHBS 2A'. South FB has most of the condominium complexes in this area - many of which appear on the sidebar to the right as a hyperlink. Use the map feature or the legal address of the condominium complex to view the available listing on the Advanced Search. The residential homes of South FB are located primarily in two areas - the oceanfront and ocean-row homes are in legal address 'Lawton Beach' and more affordable listings on the other side of South FB Drive are found in 'Palm Forest', on the other side of South FB Drive. The area is also famous for its excellent range of luxurious properties. The best thing this area has to offer for those who are looking for ambiance, is serenity. Buy the perfect beach house, and you will enjoy the breathtaking views of the sea right from the balcony of your condo. For residential properties, people generally look for the places, where calm and serene atmosphere prevails. However, along with that, you need to check some other factors. For example, you must check security, transportation, communication, modernized facilities, and other important factors. Happy searching and do not hesitate to e-mail or call the office with questions about homes, condos, villas and lots for sale on FB! Forest Beach neighborhood is divided into two sections. One section is North and another section is South. Both these sections are popular for residential properties, especially luxurious beachfront properties, like condos, villa, etc. 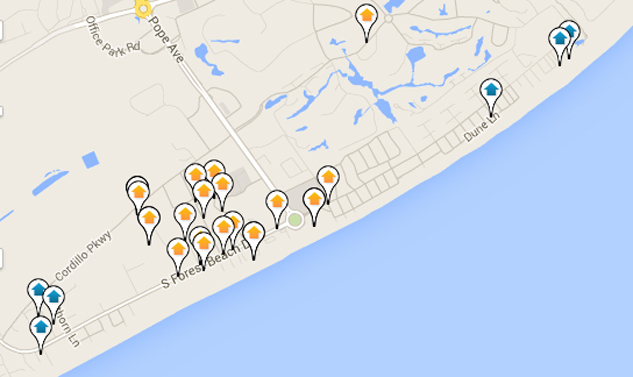 North Forest Beach is already a popular place, having plenty of houses or apartments to offer. People choose this place for its amazing transport network with the rest of the island. It also offers all modernized and urbanized facilities to the dwellers, like hospitals, golf course, beachfront restaurants, and much more. The condo complexes in North Forest Beach are Breakers, The Seacrest Villas, and North Shore Place. The streets are in mostly alphabetical order and start with Avocet, Bittern, Curlew, Dove Street, Dune Lane (actually runs parallell to the ocean, rather than perpindicular of NFB Drive, like all the other streets), Egret, Flamingto, Gannett, Heron, Ibis, Jacana, Kingfisher, Lark, Mallard, Nighthawk, Osprey, Pelican, Quail, Robin, Sandpiper, Carters Manor, Seahawk, Driftwood, Wanderer, Capri, Knotts Way, Guscio Way, Oceanwood Trace, N Forest Beach Ct, Salt Spray Lane, and Roadrunner. The South area is popular for excellent natural beauty. It is less popular than the North end and a great choice for those who want a perfect beachfront villa at a serene ambiance. Surrounded by lush green, this neighborhood is always an attractive place for the property buyers as well as investors. A fascinating part of this part is that it is a growing spot for real estate projects. Buyers have endless options at this place for properties, like condos, villa, etc. 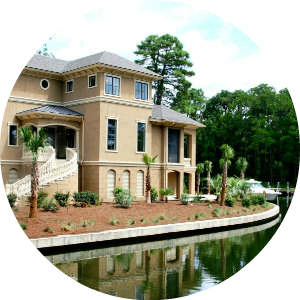 South Forest beach has a large number of villas like Ocean One, Beachwood Place, Shorewood, Sea Side Villas, Ocean Club, Hilton Head Beach Villas, Ocean Dunes, Courtside, Surf Court, and many more. The streets within Lawton Beach and Palm Forest are Sea Oak Lane, Alder, Bayberry, Cassina, Dogwood, Elderberry, Firethorn, Juniper, and Laurel. What Does Forest Beach Have to Offer? Located in the heart and center of Hilton Head Island, this beach is one of the main areas of travel and remains busiest during tourist season. This beach is broken up into the North section and the South section. The North section is home to mainly residents and people living in Hilton Head Island permanently and then second and vacation homes. The South section is filled with condos and rental homes for tourists and people who would travel to the island. Residents and tourists have a wide variety of amenities to choose from as there are more than sixty restaurants, stores and convenience stores and a huge number of shopping destinations and sites. The Coligny Beach Plaza is an awesome shopping destination and caters to almost all of your day to day needs. The Coligny Theatre and The Sandbox are close from here and there a huge number of 3 star and 5 star lodging options. Clubs and fine dining are two of the most prominent businesses over here. There are three oceanfront residential neighborhoods and two off-ocean neighborhoods. Attractive real estate investments like Surf Court and Courtside are very popular among tourists. Lawton beach which faces the ocean directly is another popular destination. Then there is Palm Forest which is across from the ocean and has three streets of homes which are ocean-oriented - Firethorn, Myrtle, and Hickory. While North Forest Beach has more of a neighborhood feel, South caters more to tourists and vacationers. Long bike trails and lush green woods can be found in this area and bicycles can be rented and used to explore the area. The adventure sports activities and camping groups are especially fun to join and provide you with a first-hand experience of hiking and adventure camping. Forest Beach Real Estate Listings Updated Regularly! You will find tons of property options in Forest Beach at a variety of prices. Whether you choose an oceanfront neighborhood or not, all villas and bungalows are in close proximity to the ocean for residents to enjoy. Our website features some of the best properties in this posh area and we make it easy for you to search for Forest Beach real estate. Apart from the featured properties, you can also find several other properties via our web search tool. 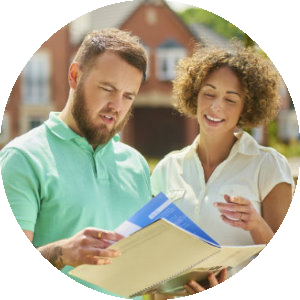 Search for the best properties at the most competitive price range via our website. If you have any questions along the way, don't hesitate to contact The Pattisall Group. Additional information on FB can be seen on the FB Property Owner's Web Site.